Minister of Financial Services, Trade and Industry, and Immigration Brent Symonette and ministry staff attended The Society of Trust and Estate Practitioners Miami Annual Summit June 1 in Miami, Florida. Minister of Financial Services, Trade and Industry, and Immigration Brent Symonette and ministry staff attended The Society of Trust and Estate Practitioners (STEP) Miami Annual Summit June 1 in Miami, Florida. Minister Symonette and ministry delegates engaged fellow attendees on topics with respect to investing and doing business in The Bahamas. The summit attracted approximately 300 professionals from around the globe. The conference focused on the latest issues concerning international private client planning, presented by leading professionals in the area who met and shared best practices. 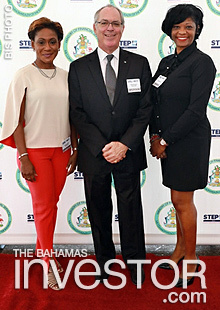 Members of The Bahamas Financial Services Board (BFSB) were also in attendance at the summit. Sidney Collie, ambassador of The Bahamas to the US was elected vice-chair of the General Committee of the Organization of American States last week. Following push back from the private sector, Deputy Prime Minister and Minister of Finance Peter Turnquest defended the government's proposed 60 per cent VAT hike this morning as he addressed the Bahamas Chamber of Commerce & Employers Confederation's annual conclave.